Mbabane is the capital of Swaziland and is located on the Mbabane River and its tributary the Polinjane River in the Mdimba Mountains. It is the second largest city in the country. The city’s name comes from an African Chief, Mbabane Kunene, who lived in the region when British settlers arrived in the late 19th century. 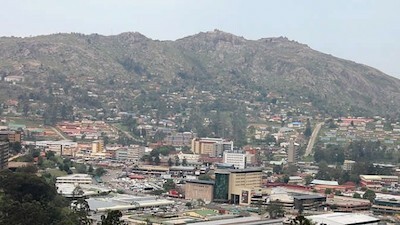 Mbabane is one of the least-populous capitals in Africa. The estimated population in 2007 was 76,000 and the 2014 estimate is 90,000. The town was founded around 1887 along the Transvaal-to-Mozambique transport route. In 1902, the British established a protectorate over Swaziland and chose Mbabane as their new headquarters. One year later, 1903, Mbabane became the capital of Swaziland following the end of the South African War (also known as Anglo-Boer War). Early Mbabane was a small town comprised of a few schools, churches, and shops established by European settlers. During most of its pre-World War II history, Africans were not permitted to live in the town and were required to reside just outside the city’s borders or in outlying rural districts. By the 1930s, the city had a number of key services such as electricity, running water, telephones, and a hospital. As the colonial regime expanded, migrant labor grew in significance. Many of Swaziland’s people were migrant laborers in South Africa or worked in a variety of European-owned tin and asbestos mines in the Protectorate. Some residents farmed and raised cattle on their own land while others worked on European-owned farms. By World War II the vast majority of Swaziland’s population worked outside of the country for a significant portion of the year or resided (and worked) in the Protectorate’s rural areas. Thus, industrial and economic development was delayed and the city’s infrastructure was underdeveloped for decades following the city’s 1887 founding. The creation of Mbabane Central School (1940) and the Mbabane Trade School (1945) were both critical in attracting indigenous people to the city and helping to stimulate growth. Following World War II, foreign investment in sugar and citrus fruits along with coal, forestry, and iron ore stimulated economic growth in Mbabane. The city also became the commercial center for the surrounding agricultural and mining regions. Mbabane by that point was also the center of a railroad network that connected nearby mines and Mozambique’s main port, Maputo. Access to education helped spawn other demands and developments. Increased education in rural areas motivated more people to migrate to Mbabane in search of new economic and social opportunities. As a result the population grew from just over 3,000 inhabitants in 1955 to nearly 24,000 in 1975. Today, Mbabane serves as a commercial hub for the surrounding region and it (along with the entire country) thrives on sugar exports and tourism. Anthony Appiah and Henry Louis Gates, Africana: The Encyclopedia of the African and African American Experience (New York: Basic Civitas Books, 1999); Peter G. Forster and Bongani J. Nsibande, Swaziland: Contemporary Social and Economic Issues (Burlington, VT: Ashgate, 2000). Social and Economic Issues (Burlington, VT: Ashgate, 2000).